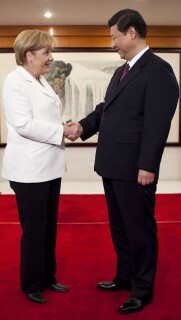 The German chancellor Angela Merkel visits China and talks to Prime Minister Wen Yiabo. She also meets the most important members the communist party, those who probably will be elected in October as Vice President and Vice Premier and new Prime Minister. Especially this meeting is important for the future relationship between Germany and China. Both, Germany and China, are dependent on each other though both demonstrate their autonomy. Both need each other and both delimit ………………….from each other. And thus it is supposed to be be a basic communication within this meeting today. How does communication or interaction between two autonomously thinking and feeling systems will function? And how this interaction, relationship will function when one main aspect of the communication is a nonverbal aspect, mainly: silence. The Chinese part integrates two aspects of silence. On the one hand this silence is in somehow typical for the Chinese communication. On the other hand silence functions as a technique to cover the stage behind. The stage of internal communication, self-representation, powerplay and whatever there will be within the communist party in the next weeks. Angela Merkel, who is famous for her competence of communication also represents another version, a so called western version of silence. Her silence is the habit of personal autonomy in contrast to the cultural autonomy of/in China. She as a person strives to be not abandoned to any person. She loves to feel free and autonomous. This in consequence means not to let others have a look into her inner mood, her ideas and strategies, her habit and her decision to go here or there. So how can this function. How can they relate and communicate in 40 minutes only regarding this background, I just described? How can they communicate by being (metaphorically and practically) silent? And yet changing diplomatic words. To me it seems that these 40 minutes are a typical lesson of nonverbal communication. That means: changing words and thus balancing on the interactional level with nuances and overtones. In order to establish spoken silence, to cover it up, so that people and media believe that they have heard a message, but still to continue with the state of silence. At the end it is just easy: everybody lives with reference to himself. Everybody clings to his own interpretation, his own awareness of the situation and all those actual or imagined nuances and overtones. Of course people will talk about it later. Of course media will publish all those different opinions later. And this, what will follow the 40 minutes of silence in China? What will be the relevant message of this communication? This, what follows and develops on the public stage, is the unspoken message of this strange relationship of silence between Merkel and China. Ant the specific tool of communication is: a dialogue of silence. This will be the actual base and essence of these important 40 minutes.